The Commonwealth Lawyers Association (CLA) recently organised the 18th Commonwealth Law Conference in Cape Town, South Africa. The theme of the conference was “Common Challenges – Common Solutions: Commonwealth, Commerce and Ubuntu” and it was attended by over 800 delegates. There were 48 sessions divided into 4 topical streams, namely; Corporate and Commercial Law, Legal and Judicial Profession, Constitutionalism, Human Rights and the Rule of Law and Contemporary Legal Topics. The firm was represented by our Managing Partner, Dato’ Dr. Cyrus Das and Steven Thiru. Dato’ Dr. Das is a Life President of the CLA and he chaired the session entitled “Pluralistic Legal Systems : Custom, Tradition and Religion”. Steven Thiru, who is a Council member of the CLA, delivered a paper on the Lina Joy case in the “Unity and Diversity in the Commonwealth : Five interesting cases from across the Commonwealth” session. Both sessions were very well attended and well received. Steven Thiru also spoke, on behalf of the Malaysian Bar, in the session entitled “Lawyers in the Frontline”. 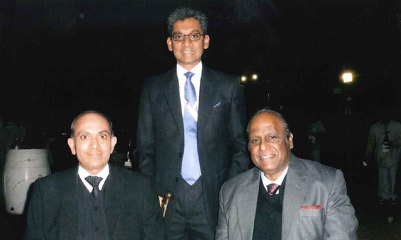 Left to right: Dr. Venkat Iyer (Editor of the Commonweath Lawyer), Mr. Steven Thiru, Dato Dr. Cyrus Das.